The constellation Delphinus. Roll mouse over to see labels. Delphinus is a moderately small and faint constellation which lies close to the southern vertex of the Summer Triangle asterism, near the star Altair in Aquila. It is highest in the evening sky in the months around July. At its center is a grouping of fourth-magnitude stars, forming an asterism sometimes known as Job's Coffin because of its box-like shape. The name ‘Delphinus’ is Latin for ‘dolphin’, usually identified as the messenger of Poseidon, sent to entreat the sea nymph Amphitrite to marry him. 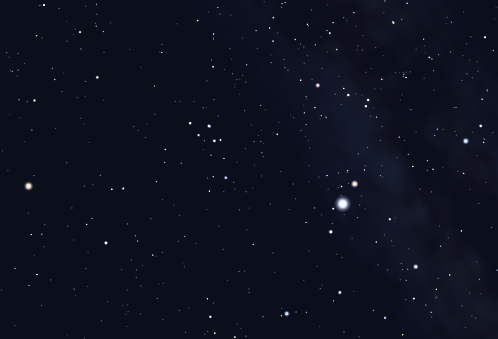 The constellation's two brightest stars are sometimes called Rotanev and Sualocin. These strange names first appeared in the Palermo Catalogue of 1814. Together, they spell out the name Nicolaus Venator backwards, which is the Latinized form of Niccolo Cacciatore, an observing assistant. They are the only example of stars named after a real person. Delphinus is home to a number of notable deep sky objects, including the globular cluster NGC 6934 and the planetary nebula NGC 6891. Delphinus contains the following Caldwell objects: C42, C47. 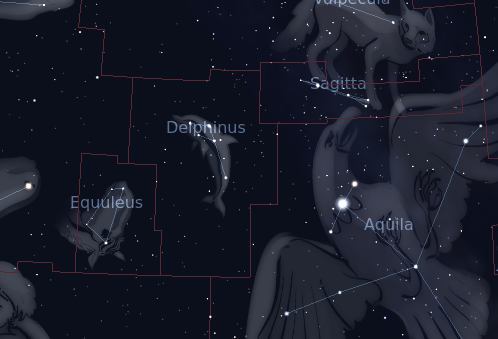 The following constellations neighbor Delphinus: Aquarius, Aquila, Equuleus, Pegasus, Sagitta, Vulpecula.